It was all TV and radio for us for the last few days. We chatted with the excellent Donna G on her program The More the Merrier on CIUT radio on Saturday about the upcoming Her Leaves be Green concert. There is a podcast of the show available at the link to her program. On Monday were were on Daytime Toronto, where Hallie was identified as having 'the voice of an angel' by the presenter. The other presenter, Chris, was blown away, literally and figuratively, when the diminutive Hallie opened up the hood an revved it up a bity for the higher stuff in Henry Lawes and John Donne's Sweet stay awhile, he sitting on the couch next to her. He then reached over and moved the mic on the coffee table back a foot or so. This coming Saturday we'll be doing part of the Leaves be Green show at an academic conference at University of Toronto. Prof. Deanne Williams will doing a paper called The Paratextual Girl. 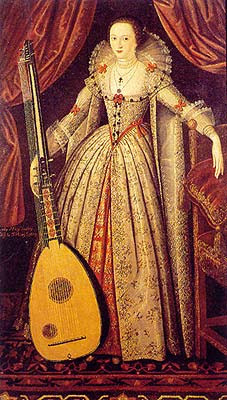 At the top is Mary Wroth with a theorbo. She is pretty proud of it I think.